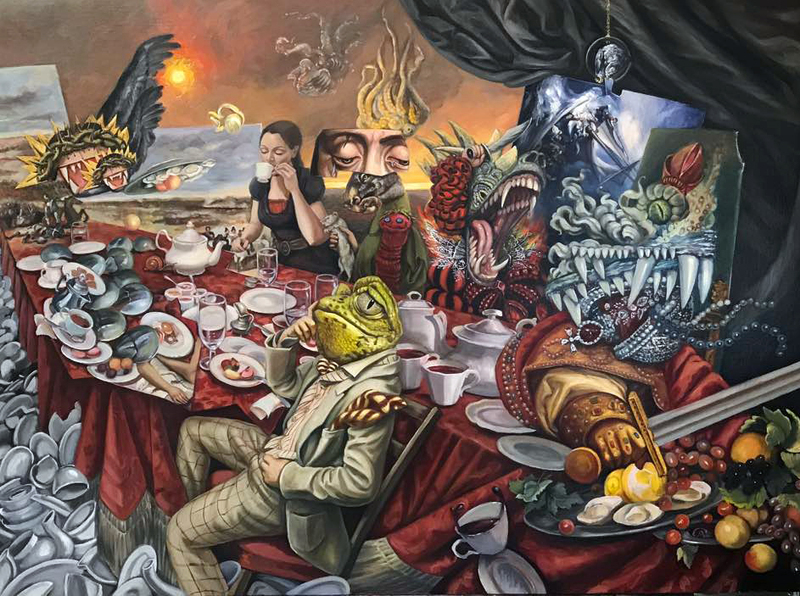 FSU Art Associate Professor Carrie Ann Baade will be exhibiting her painting “Allegory of Bad Government” at Mesa Contemporary Museum. This painting represents a six year journey starting with researching the history painting by the same title created by Ambrogio Lorenzetti in 1338 in Town Hall of Siena, Italy. Baade sought to respond to this historical work with her own. Arranged in the style of Alice in Wonderland, Baade characters embody self-loathing, rage, tyranny, sloth or narcism, and hubris. The images of blue skies propped up around the table are of the Napoleonic War showing a history of war that can do nothing to inspire change, but is a war within a war, a destruction of earth without a chance for redemption. On the far left is the gluttonous Tyrant, made of multiple layers of teeth with a regal crown in its terrible mouth and a papal hat on its head. This figure knocks his full plate to the floor. The cape of Tyranny is the tablecloth. To sit at this table, is to participate in Tyranny’s oppression, the greed and excess. For any of these individuals to sit at that table, they are participating in the most egregious violations of ethics and harmony. For more information, please visit the Mesa Arts Center website.